As a food blogger, I am in the kitchen a pretty large part of the day. If I am not recipe testing, I am pre-planning posts and creating delicious meals. With all the pans, pots, bowls and utensils I use a day, if I don’t clean up as I go, it will take me hours every evening to clean everything up. That’s no fun! I wish my kitchen would just clean itself, but that isn’t going to happen, so I make a point to clean up during and after each recipe/dish that I make. 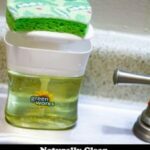 Once I discovered the new Clorox Green Works Pump ‘N Clean I knew I had found the solution! 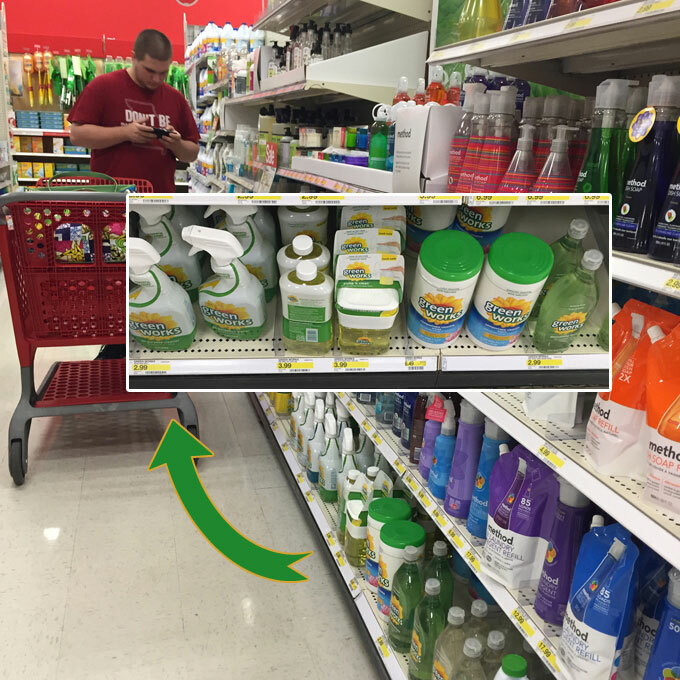 We found the Clorox Green Works Pump ‘N Clean at Target! They have the entire line of Green Works products, and there is a product for just about anything in your home you can think of. The products are found in the natural cleaning aisle of your local Target stores, and I recently learned that Target is the only store that carries the entire Green Works line! You can see my son in the photo below using his phone to pull up the Target Cartwheel app to get a coupon on Clorox Green Works Pump ‘N Clean. From June 14-July 11, you can use the Target Cartwheel app to save 10% on all varieties of Green Works products (including Pump ‘N Clean, of course!). The Pump ‘N Clean is food-safe, so you can clean your knife in between cutting veggies, which is a great help since I chop and slice a lot of veggies. This product is not made to clean up after raw meat or fish, however, so don’t do that. Let’s face it, a balanced, natural lifestyle begins with a clean home, and we are all striving to live a more natural lifestyle at our house. Clorox has made it their mission to help moms who are looking for ways to live a more natural lifestyle achieve their goal. This is good news for me, because I need an easy, yet safe way to clean up as I go. There is a natural Green Works product for every room of your home, and they are all shockingly powerful and naturally derived. But honestly, the new Green Works Pump ‘N Clean, is my favorite product. It is so simple to use, you just dispense the cleaning liquid on your rag or sponge with a single pump, wipe and go! And because it’s safe to use around food I can clean my kitchen as I cook and create endless, delicious dishes. What other product promises that? I use it for surface cleaning, dishes, cutting boards and so much more! This is the first dish I was able to make once I had the new Clorox Green Works Pump ‘N Clean, and I cannot tell you how nice it was to get to the end and know that all I had to do was clean out my cast iron skillet because the knives, cutting boards and other items I used were already clean and ready for the next item. This is a ridiculously easy dish, that was made up of a bunch of veggies I had from the garden, as well as a bag of yellow gold potatoes I had on hand. It is a great, flavorful side dish to pair with any meal! In a large skillet, saute the garlic and onion in the olive oil over medium heat for 2 minutes. In a large bowl, toss ALL the vegetables in a little olive oil and season to taste. Put everything into the skillet and cover for 10 minutes. Remove lid and continue cooking another 10-12 minutes stirring everything often. Serve as a side dish with anything! I have shared how I keep my kitchen clean, along with my favorite summer veggie dish, I would love for you to tell me your favorite kitchen cleaning tips and what your favorite summer recipe is, in the comments below.